In 2-quart saucepan, heat butter over medium heat. Add onion; cook about 4 minutes, stirring occasionally, until softened. Add flour and taco seasoning mix; cook 2 minutes. Beat in chicken broth with whisk; heat to boiling. Cook 1 to 2 minutes or until thickened. Remove from heat; stir in sour cream and green chiles. Set aside. Meanwhile, in 12-inch skillet, cook bacon 6 to 7 minutes over medium heat, turning occasionally, until crisp. Remove bacon from skillet. Reserve 1 tablespoon drippings in skillet. Crumble bacon; set aside. In medium bowl, beat eggs, half-and-half, salt and cumin with whisk until well blended. Cook in same skillet with drippings over medium heat 4 to 5 minutes, stirring frequently, until eggs are set. Spread 1 cup of the sauce over bottom of baking dish. Fill each tortilla with about 1/2 cup eggs, 1 tablespoon bacon and 2 tablespoons cheese; roll up. Place seam side down on sauce in baking dish. Pour remaining sauce over filled tortillas. 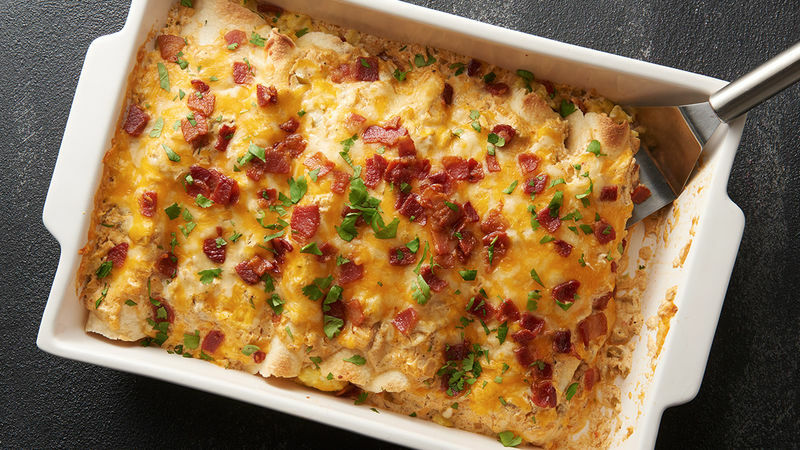 Top with remaining cheese and bacon. Bake 20 to 25 minutes or until thoroughly heated and bubbly. Garnish with cilantro leaves.